The current exhibition of works by Natalia Lach Lachowicz presents little known episodes from her unusually internally coherent career. It is coherent not only in terms of the problems that she has been probing since the end of the 1960s but also in terms of consistent use of visual media (photography, film and video) in her complex and diverse art. She used them differently, both from the technological and practical point of view of each medium, in different periods. And one of the most important problems in the art of Natalia LL through the years has been the abolishing of the real – or perhaps only illusory – contradiction of the dynamie tensions that arise between the mental and the intellectual on the one band, and the corporeal and the emotional on the other – both in the world of humans and in art. Her art harmoniously embraces both these elements by adopting an intellectual attitude that helps us perform intellectual operations on the literal content of her images. And the content is the female body – usually the naked body of the authoress. The image of a naked body is always perceived very emotionally. In the 70s emotions in conflict with Natalia LL’s extremely rational attitude were neutralized by means of the conceptual method and photographic imagery. Reducing the photograph of the body to a sign that is repeated in different contexts and configurations of structures of series of photographs neutralizes their natural expressiveness, but it did not eliminate it completely, only to the extent that the expressive element is not an essentially important factor in the process of creating the work and in the process of reception – though on the condition that it is perceived according to the artist’s intention. And these are the problems that the works – little known episodes in the career of Natalia LL in the 1970s presented here – refer to. Episode One, The Gay Pride Parade, New York (1977) is a photographic document of the authoress’s activity in a public place, in a specific street context. Photography was employed here in its most basis and obvious documentary function. Individual pictures of the series show Natalia LL in the streets of New York during the Gay Pride Parade; she is holding a kind of a self-quotation, i.e. 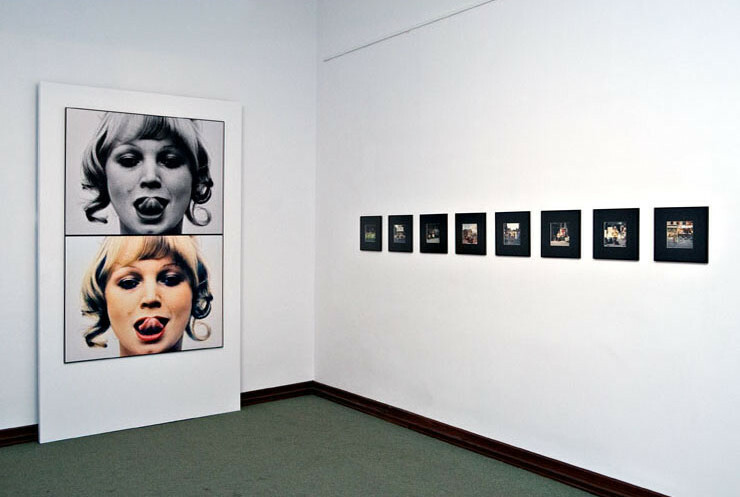 a few photos from her well-known series Consumer Art (1973). We have before us a document of the artist who was physically present m the streets, along with her own works, in various situations, extremely different culturally, socially and communally from everyday life in Poland of the times. This double removal of a single image from its context – the cultural context and the context of a long series of photographs that make up Consumer Art – is a suitable example of what the artist was exploring in those days, which was the nature of the image as a sign whose meaning — for example when the context has changed — may also change. Next episodes, Quadruple Downiness (1978/2007) and Animal Art (1978), contain certain corporeal and biological motifs which have always been present in the art of Natalia LL who in the 1970s was one of the very few representatives of feminist body-art on the Polish scene. The biological aspect of both works was, however, rather ambiguous. 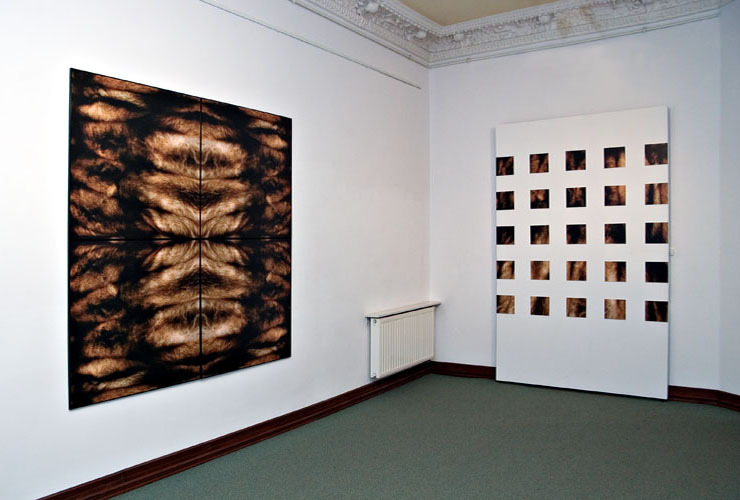 The animality from the title of the second series does not mean that an animal is literally present in the picture – only its fur is, and it covers the artist’s naked body. Fur, on the other hand, consists of a series of images of fur that was a prop in her own Animal Art. Put together, these photographs take on an intriguing, purely plastic form. Primal, animal biology undergoes gradual, deep transformation here, becoming first an elegant and valuable part of a woman’s outfit, later a prop used in something resembling a performance, and finally a repetitive motif that creates intriguing and visually attractive images whose content is never obvious. It often happens that the discovery of such episodes, still unknown in the popular biography of an artist, creates the problem of including them in it and finding a proper place for them beside other, already revealed episodes. However, this problem does not concern the works presented at this exhibition, as they are pure Natalia Lach-Lachowicz, the one we have known so well and accepted; and they do not change the nature of her art, just enrich and supplement it.